Moen is one of the best kitchen faucet brands in North America, and with a history of over 75 years, it has become remarkably established. It is estimated that for every hour the average American spends in their living room, they spend 5.6 hours in the kitchen – preparing food; washing dishes; cleaning hands (or grubby children) - Moen’s mission is simple: to improve everyday life. 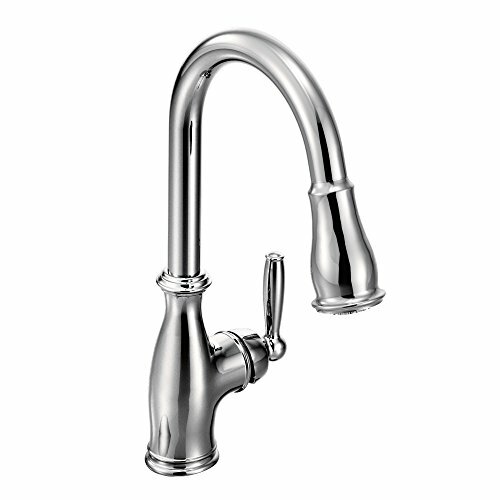 Moen’s kitchen sink faucets and fixtures have revolutionized plumbing and brought more joy to the kitchen. Their designs can be spotted in bathrooms and kitchens across the US, and it’s not hard to see why. We look at their best models and the Moen kitchen faucet reviews. The story of Moen began in 1937 when a man named Al Moen went to wash hands in the sink that had two-handles. Without control over the temperature, he accidentally scorched his hands as extremely hot water burst from the tap. It was this moment that inspired his pursuit of intelligent water delivery technology and complete control temperature. He worked tirelessly to invent the single-handle faucet – a style that is still prevalent in bathrooms and kitchens worldwide today, both residentially and commercially - and by 1950 the brand was catapulted to national acclaim and being sold all over the country. From then, Moen and his company worked to develop upscale and boutique products, and in 1979 they introduced their first two-handle model line with a patented, washer-free cartridge that resisted build-up. After Moen’s retirement in 1982, the company continued to innovate, bringing out their first bathtub line and then inventing a non-tarnish finish ‘LifeShine’, which came with the first ever lifetime warranty. But they didn’t stop there. In 1998 Moen created the Pure Touch filter system, which combined pull-out technology with water filtration. Since then, they have continued to put the customer first, catering to all tastes, interiors, and styles and offering over 1,000 product finishes, including stainless and SpotResist finishes such as brushed nickel. Their latest smart feature is motion sensor - technology that was developed in 2012 and has perfected hands-free convenience. In 2014 the company celebrated an impressive 75 years of dedication to faucet technology. Moen’s catalog is extensive; they offer a wide range of styles, shapes, colors, and features, catering to all interiors and homes. Moen’s website lets you browse by category: kitchen, bar and prep, beverage, and laundry and utility; browse by finishes: chrome, spot resist stainless, bronze and matte black; and browse by style and collection: modern, traditional and transition. Its user-friendly website mirrors the Moen’s philosophy and dedication to helping its customers and reveals the brand’s expertise in water-work innovation. Most of their models have a single-handle - honoring the brand’s innovative origins - but that doesn’t mean their two handle options are limited. 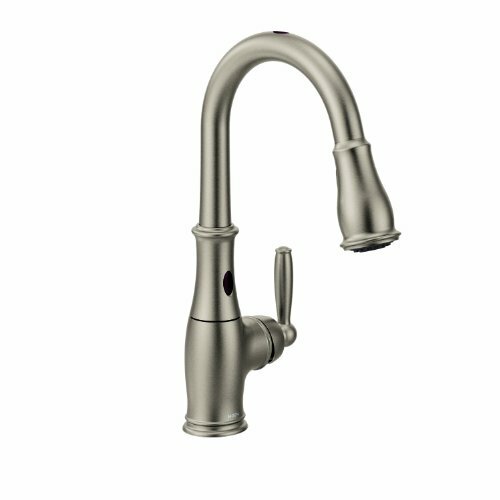 Moen offers some of the most popular kitchen faucet products on the market, for example, the Moen Essie Spot Resist Stainless One-Handle High Arc Pulldown model (also known as the Moen 87014srs). Its features include (but are not limited to) PowerClean spray technology for more powerful washing, a pulldown hose for flexible water delivery and one-handle lever for easy water adjustment. It can be mounted on one, two, three or four holes, and has a Spot Resist stainless steel finish that does not show fingermarks or water spots. 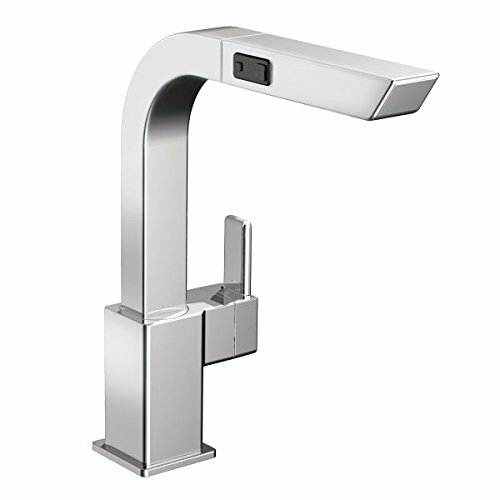 And for those looking for Moen kitchen faucets with soap dispenser, this model offers that as well. The finish is arguably as important as the style. When shopping around, it’s important to consider the rest of the kitchen and its other fixtures. It’s easy to mismatch the faucet, meaning it looks peculiar and out-of-place: for example, a brass faucet against existing chrome finishes will look out of place. Luckily, the brand is not short on finish and color options, so whether you’re after a new sink area or a whole new kitchen, you’ll be sure to find a finish that works for you. For those who are looking for something a bit more dramatic, why not opt for a Moen black kitchen faucet. You can get matte black models in multiple styles, from a high arc one-handle pulldown model to a wrought iron two-handle variation; the possibilities and variations are endless. On the other end of the spectrum is the Moen white kitchen faucet. Though white styles are generally not as popular as other finishes, Moen can still be counted upon to provide the option. For example, they offer the white Banbury Glacier One-Handle Pullout, the white Renzo Glacier One-Handle Low Arc Pullout, and white soap dispensers. The collection of brass faucets is quite impressive. The finish is opulent and stylish, and they would transform any kitchen into a luxurious and elegant space. You can also choose from single-handle or two-handle faucets, with either high or low arcs. If you want your kitchen (or bathroom) to really wow, brass is the finish for you. Moen has a great selection of faucets with a brushed nickel finish, but they are reserved solely for the bathroom variation (bathroom sinks and bathtubs). A chrome finish is perhaps the most popular of kitchen finishes, as it looks sleek and is easy to clean. Moen spoils its customers with choices, with over 100 styles available with a chrome finish: from high arc pullout types to two-handle low arc types. 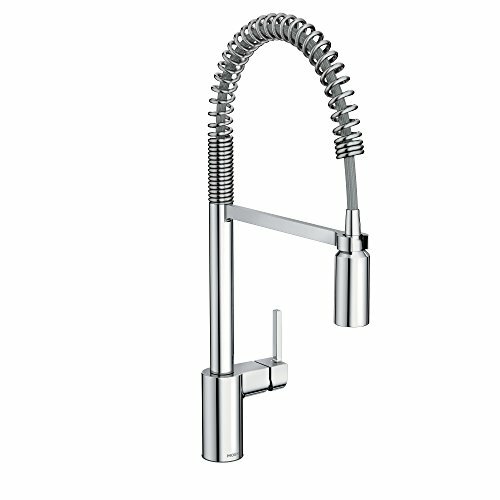 Moen’s seemingly limitless collection of kitchen faucets in all types and styles is what has earned their reputation as the #1 plumbing brand in North America. One, Two, Three or Four holes? The great thing about Moen’s designs is that a lot of them come with various mounting options, so you can find a Moen 3 hole kitchen faucet to fit your installation requirements, for example. When conducting your research on kitchen fixtures and accessories, you may have come across the term ‘gooseneck’ to describe the shape of a faucet. The gooseneck shape is another way of saying high arc (as a high arc looks like the neck of a goose). Moen gooseneck kitchen faucets, therefore, are available in abundance. Moen has spent over 75 years developing its faucet technology, and they continue to revolutionize kitchen and bathrooms all over the world. Side sprayers sit adjacent to the faucet, ready to be picked up at any moment like a shower head to blast water where it’s needed. The Moen kitchen faucet with sprayer is a great option for those who want to take control over their washing tasks, such as tackling stubborn stains on dishes. The innovative Reflex technology gives users the best washing experience possible. 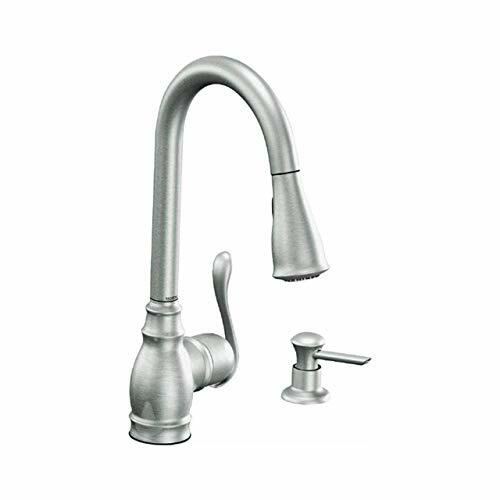 Both Moen pull down and pull out kitchen faucets are retractable, meaning once you’re finished maneuvering the flexible hose around your sink, the hose will effortlessly and smoothly return to its docking point. Stemming from the inspirational story of its founder, the brand works mostly with Moen single lever kitchen faucets. 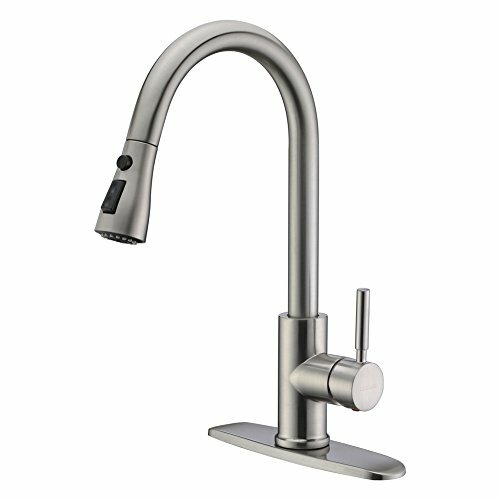 Moen one handle kitchen faucets are renowned for being sleek in design and innovative in technology, and allow the user to have precise and accurate water temperature and pressure. Experts designed MotionSense for ultimate convenience. 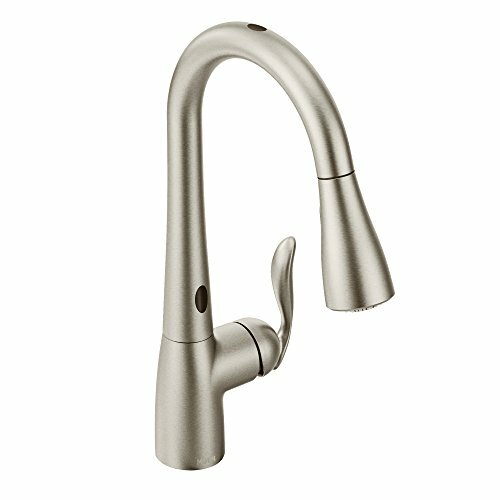 Moen touchless kitchen faucets mean all you have to do to get the water flowing is to wave your hand over the fixture. This means less hassle when you’re carrying heavy pots and pans that need immediate rinsing as well as less dirty finger marks on the model itself. The Moen Ready Sensor is always on standby and is incredibly efficient - once you try it you won’t want to go back! As stated earlier, Moen has categorized their faucets styles as either modern, traditional or transitional. The ‘modern’ collection focus on cool and sleek designs, emitting a minimal and fresh feel, whether in the kitchen or the bathroom. The ‘traditional’ collection is all about coziness and warmth, taking the best from classic designs with decadent detailing. The ‘transitional’ collection is about spinning and old look with something new. These collections are perfect if you like a classic look and finish but want contemporary elements. Moen’s collections aren’t limited only to faucets but include a wide range of kitchen and bath fixtures. There is no disputing the value and performance of all Moen kitchen faucet models - from modern to traditional styles, chrome to matte black finishes, and state-of-the-art technology. The prices don’t dramatically exceed those of other similar brands on the market, but you can’t put a price on their dedication to innovation and efficient technologies. Is a Moen faucet for you? Infinite styles: Moen’s long history of innovation means it has a vast repertoire of designs to suit all interiors and kitchen styles. ADA Compliant: All of the models are ADA Compliant, meaning users who are disabled or have limited mobility can use them. Improved convenience: The technologies available with these fixtures drastically improve life in the kitchen, from MotionSense and Reflex System to Power Clean. 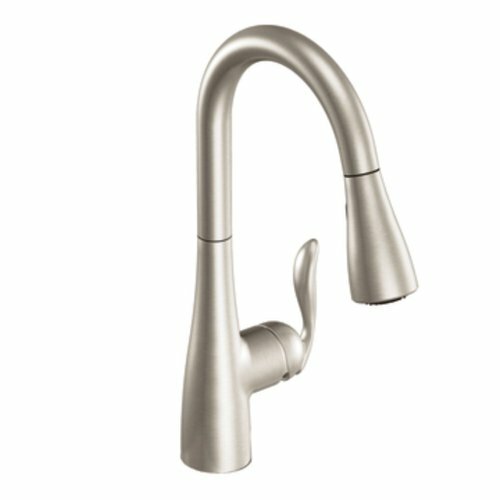 Moen faucet reviews are incredibly positive. The overwhelming response being that their smart advancements greatly improve everyday life and make washing dishes and preparing food more enjoyable. After all, the kitchen sink is the most-used tool in the house. For more information, see our complete list of the best kitchen faucets.